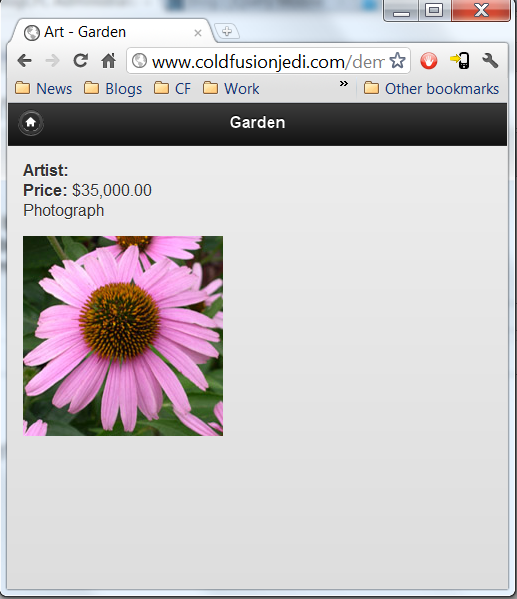 So about a week or so ago I had an idea about a simple jQuery Mobile application that would make use of Local Storage. That was a week ago. Turns out - the “simple” application turned out to be a royal pain in the rear. Not because of Local Storage, but because of some misconceptions and lack of knowledge on my part in jQuery Mobile. What followed was a couple painful days (and more than a few curse words) but after all of that, I feel like I’ve got a better understanding of jQuery Mobile and got to play with some new features. So with that being said, let’s get to the app. 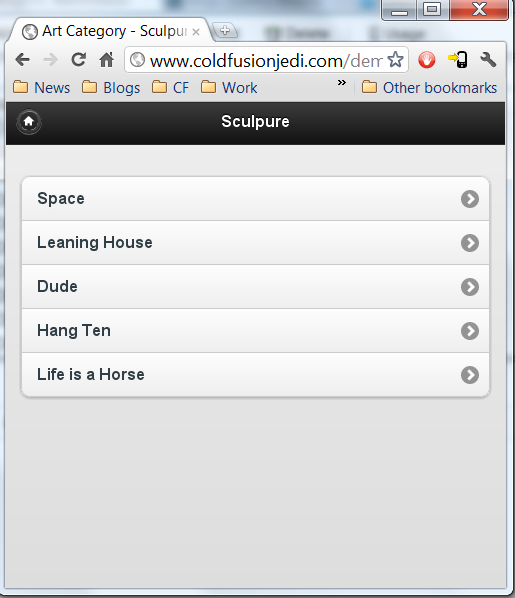 My application consists of three HTML files, all powered by ColdFusion. 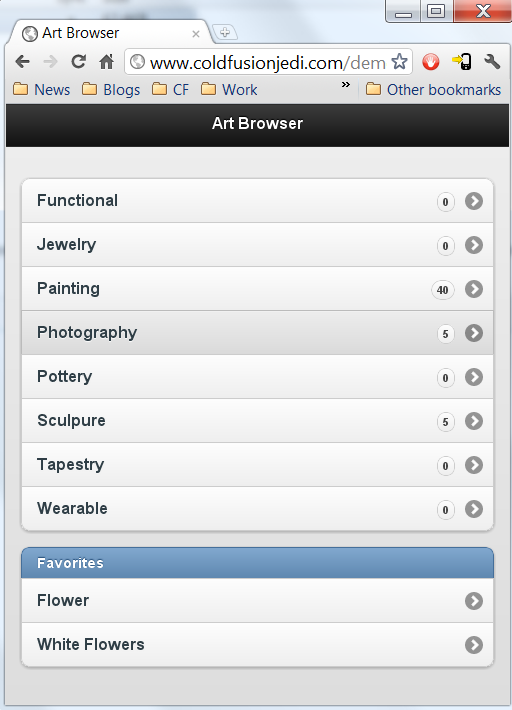 The home page will list categories, the category page will list art, and the detail page will show just an art piece. Let's start with the index page. Note that I begin by asking for media types. Our database categories art by a media type and I'll be considering that my categories. The getMediaTypes method returns a query which means I can simply loop over it in my content. Next up we have the category page - which is really just a slightly different version of the last one. Note though the use of the Home icon. Sorry, no art in this category. And finally, let's look at our detail page. This page is even simpler. We just get the art detail and render it within the page. Nothing fancy at all - not yet anyway. Ok, ready to go crazy? I decided on two main changes to my application. 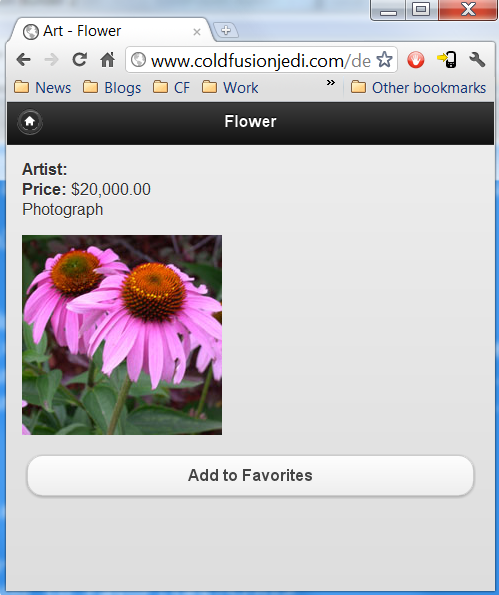 First, art pieces would have a new button, Add to Favorites (or Remove from Favorites). Once clicked, I'd use a jQuery Mobile dialog to prompt the user if they were sure. (Normally I hate crap like that. Don't second guess me. But I wanted to try dialogs in jQuery Mobile.) If the user confirms the action, I then simply update local storage to store the value. Since you can only store simple values, I used built in JSON features to store complex data about the art piece (really just the ID and name). On the home page, I had, what I thought, was a simple thing to do. When the page loads, simply fill out a dynamic list of the user favorites. Here's where things really took a turn for the worst for me. 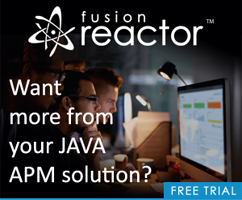 I want to give a huge shout out to user aaraonpadoshek who helped me out on the jQuery Mobile forums. I'll show the new home page and explain what changed. Ok - a bit more going on here. I'll take it step by step. On top I've got two utility functions taken based on code from the DiveIntoHTML5 site. One checks for local storage support and one for JSON. It's probably overkill for mobile, but it doesn't hurt. Notice that I check both of these functions before I do anything else. It occurs to me that I wrapped up a lot of code in that IF and I should have simply exited the document.ready event handler instead. I begin by using the "pageshow" event for my art detail page to decide if I should show the "Add to" or "Remove from" buttons. The hasInStorage function is defined later on and is just a utility I wrote for my code to quickly see if a particular art piece is favorited. I'll show that art page in a bit so you can see the HTML differences. The next two functions listen for clicks on the new buttons. Notice the "vclick" listener. This is not - as far as I know - actually documented. At least 5 of my gray hairs this week came from this. Apparently this is the new way to listen in for click events on multiple devices. It's in the jQuery Mobile blog, but again, it isn't documented. When I went live and tested my code, it had worked fine in Chrome but not at all in iOS or Android. Apparently this is why. Very frustrating! Notice - when you click, I use the built in changePage utility to load a page. But this is the cool thing - I can turn this into a dialog by adding a role attribute. So basically - addtofav.cfm and removefromfav.cfm are normal pages - but because of how I tell jQuery Mobile to load them, turn turn into dialogs. Sweet. Moving down - the next two event handlers are for the actual confirmations. Nothing special there. They call my utility functions defined later on to change local storage values. Ok - so here is the part I really struggled with and where aaraonpadoshek helped. I needed a way to say, "When the page loads, write out the list." Unfortunately, the pageshow event, which runs every time, also runs before the page initializes. Read that again - it runs every time the page shows and also before it's even fully drawn. There's a pageinit method which does run after the page initializes but only runs once. So when I used pageshow and tried to change my list, I got an error because jQuery Mobile hadn't added the magical unicorn dust yet to make it pretty. When I used pageinit it worked... once. Here's where Aaron's code helped. Notice we have pagebeforeshow being listened for now. It now detects in the list exists in the DOM. If it doesn't, we create it and initialize it ourselves as a list view. If it does exist, we update it using refresh. I'll be honest and say this still is a bit... fuzzy... in my mind. But it works! And that's good enough for me. I've got a bit of DRY going on there with the display but I'll fix that later. That's the two buttons. Notice they are both hidden by default. Also note the use of data-artid to store in the primary key I'll use later. Now let's look at addtofav.cfm. I won't bother with the remove as it's pretty much the same. And here's a shot of the dialog. Adding that helped right away. Ok - that's it. I've included a zip below and you can play with this yourself via the uber Demo button. Enjoy.